2. 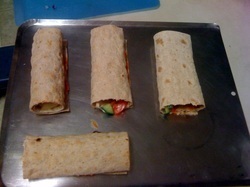 Layout tortilla or lavash bread and spread hummus liberally all over the bread. 3. Pile on veggies and then roll up. 4. Put in the oven to bake for 8-10 minutes.